Dalet today announced that Bayerischer Rundfunk, a member of the German Public Broadcast Group ARD, has selected Dalet Galaxy for its news production platform. Working with long-time technology partner, Thum + Mahr GmbH, who is the general contractor for the project, Dalet met the extensive tender requirements by providing a Media Asset Management-driven editorial platform that integrates video production and automates key ingest and distribution workflows. Described as a strategic project by Bayerischer Rundfunk, the Production Management System is an important step in the implementation of future-oriented strategies for the latest editorial team workflows. Dalet Digital Media Systems, a leading provider of software solutions and services for media organizations, today announced that Bayerischer Rundfunk, a member of the German Public Broadcast Group ARD, has selected Dalet Galaxy for its news production platform. Working with long-time technology partner, Thum + Mahr GmbH, who is the general contractor for the project, Dalet met the extensive tender requirements by providing a Media Asset Management-driven editorial platform that integrates video production and automates key ingest and distribution workflows. Described as a strategic project by Bayerischer Rundfunk, the Production Management System is an important step in the implementation of future-oriented strategies for the latest editorial team workflows. Bayerischer Rundfunk will utilise the advanced Dalet Galaxy API to integrate a number of third-party systems including ingest servers, production storage and Adobe Premiere Pro CC editors. The integrated Dalet Workflow Engine will serve to automate Bayerischer Rundfunk's custom ingest and distribution workflows. “Fragmented editorial workflows are inefficient and costly. 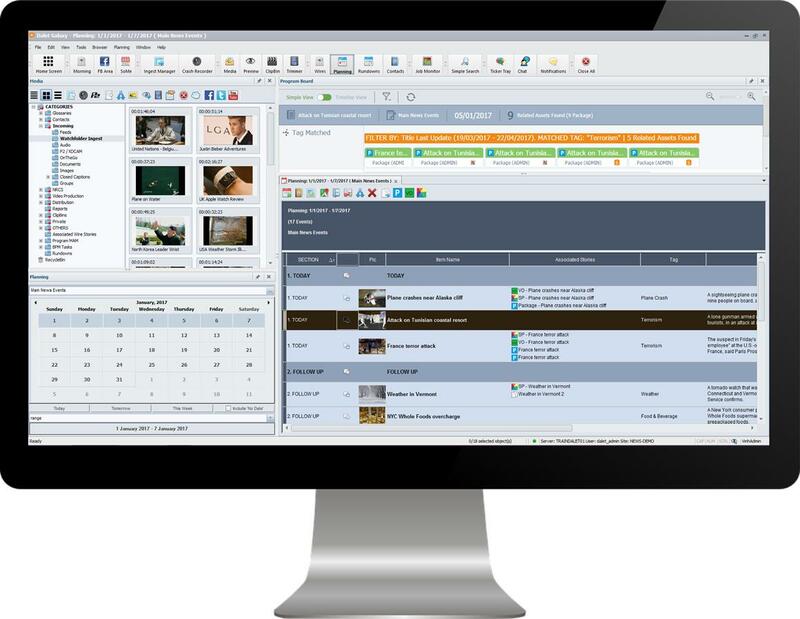 Dalet Galaxy is the ideal platform to not only connect news teams for optimal efficiency, but innovate the way in which they orchestrate their internal workflows and manage content,” states Johann Zemmour, director of sales EMEA & APAC, Dalet. “As the trend is to shift away from siloed productions, news broadcasters need integrated solutions that help them harness the potential of the multi-platform distribution world. Dalet’s proven MAM-driven editorial platform met stringent requirements of workflow orchestration, metadata management and seamless third-party integration to help BR make the shift.” Stefan Mertens, managing director (COO) at Thum + Mahr, concludes: "We are proud to have been contracted by Bayerischer Rundfunk together with our technology partner, Dalet, for such an important workflow and technology transformation project within BR." Thum+Mahr GmbH is a leading systems integrator and solution architect in the fields of broadcasting and media technology, specialising in multimedia News Room integration, media workflow solutions and Radio automation and mixing systems integration. The company has locations in Monheim am Rhein and a Paris office as well as business partners in Munich, London, Dubai and Singapore with a team of 50 employees. With a powerful spectrum of services consisting of consulting, systems integration and service & support, Thum+Mahr offers a holistic expertise in the design, development, implementation and support of media technology infrastructures. As an independent, private limited company we are not tied to any other manufacturers or equipment suppliers meaning we are well placed to provide impartial advice and supplying the most appropriate technology to meet our customer's requirements. Thum+Mahr´s customers are TV and Radio broadcasters around the world, including: BBC, BBC World Service, RTL Group, Radio France, FMM, RFI, ARD Group, BR, hr, MDR, NDR, rbb, SWR, WDR, ORF, RT Malaysia, All India Radio, ERTU, and Polski Radio. Dalet Digital Media Systems, a leading provider of software-based solutions for media organizations, today announced that World Is One News (WION), the youngest venture of Zee Media Corporation, launched WION underpinned by Dalet Unified News Operations. The Dalet solution is powering and supporting the international news channel with comprehensive media logistics, newsroom computer system and news production workflow facilitated by the Dalet Galaxy Media Asset Management (MAM) and orchestration platform, with full ingest and playout operations relying on Dalet Brio video servers. WION delivers path-breaking news coverage from across the globe with a South Asian perspective to international audiences across the web, mobile devices and TV. Operated by Zee Media Corporation with headquarters in India and bureaus in 37 global locations, WION is the first India-based network to have a presence in the U.K., U.S., China, Russia and Africa, making it South Asia’s first truly convergent, multi-media English news network. A critical aspect of the installation for WION was to enable journalists and producers to upload content from the field directly to the broadcaster’s customized Content Management System (CMS), an action that automatically creates planning events thanks to the Dalet Unified News Operations collaborative workflow. “Our philosophy of ‘being one with the world’ holds that news is the common thread that binds us all together and makes critical the ability to deliver news in the moment, from anywhere to any channel,” says WION Editor-in-Chief Mr. Rohit Gandhi. “We sought and found a partner in Dalet to provide the backbone to our network-wide news infrastructure. The solution not only accelerates time to air but enables better collaboration with a highly efficient and agile set of tools, from remote content creation to centralized content curation and onwards to publication on the digital and TV platforms our audiences are choosing.” WION is the first broadcaster in India to deploy the Dalet Galaxy-based Unified News Operations workflow. Easy-to-use production tools via web-based Dalet WebSpace and relevant story content are readily available to every user in the newsroom and in the field. When WION journalists receive a notification about an assignment, they can search, browse and access every asset in the Dalet platform from their desktop, laptop or mobile device, whether it is news wires and footage that just came in, or existing stories and video packages. Beyond the walls of the newsroom, WION journalists use the Dalet On-the-Go mobile app to check assignments and create packages, exporting content to the CMS, as well as to YouTube, Facebook and Twitter. Video and scripts can be logged and edited within Dalet OneCut, or sent to Adobe Premiere via Dalet Xtend for craft editing. Media and associated metadata are tracked and managed by Dalet Galaxy every step of the way, including playlist export and import to and from the CMS. Once approved by a producer, final content is readily available for use in the built-in production control room automation and exported to the CMS as a multimedia story object. Beyond the comprehensive set of tools and services natively built into Dalet Galaxy, the advanced web-services API integrates and unifies the full ecosystem of technologies and in-house tools used at Zee WION, including the custom CMS based on Kentico that drives workflows within the Dalet solution. Other integrations include WINBDL teleprompter, WASP graphics system and Quantum SNFS with NetApp E series storage. “This installation is a perfect example of the Dalet Unified News Operations solution. Having the NRCS, the production tools and the archives fully integrated, along with a flexible workflow engine and web-services API, enables WION to truly implement a ‘digital first’ approach to deliver the right content, on the right device, to the right audience, ahead of the competition,” says Raoul Cospen, general manager of Dalet Asia Pacific. “Deployed in record time, the end-to-end workflow was on air within a few short weeks of signing the contract for Dalet Unified News Operations.” For more information, please visit Dalet at www.dalet.com About Dalet Digital Media Systems Dalet software-based solutions enable media organizations to create, manage and distribute content faster and more efficiently, fully maximizing the value of assets. Dalet products are built on three distinct platforms that, when combined, form versatile business solutions that power end-to-end workflows for news, sports, program preparation, production, archive and radio. Individually, Dalet platforms and products offer targeted applications with key capabilities to address critical media workflow functions such as ingest, QC, edit, transcode and multiplatform distribution. The foundation for Dalet productivity-enhancing workflow solutions, Dalet Galaxy is the enterprise NRCS and MAM that unifies the content chain by managing assets, metadata, workflows and processes across multiple and diverse production and distribution systems. Specially tailored for news and media workflows, this unique technology platform helps broadcasters and media professionals increase productivity while providing operational and business visibility. Dalet AmberFin is the high-quality, scalable transcoding platform with fully integrated ingest, mastering, QC and review functionalities, enabling facilities to make great pictures in a scalable, reliable and interoperable way. Addressing the demanding needs of studio production, multi-camera ingest, sports logging and highlights production, the innovative Dalet Brio video server platform combines density and cost-effectiveness with high reliability. Dalet supports customers from the initial planning stages to well beyond project execution. Our global presence includes 17 offices strategically located throughout Europe, the Middle East, Asia Pacific, North America and South America, and a network of more than 60 professional partners serving 87 countries worldwide. This collective experience and knowledge enables our customers to realize potential increases in productivity, efficiency and value of their assets. The comprehensive Dalet Care program ensures deployments remain up and running with 24/7 support 365 days a year. Dalet systems are used around the world by many thousands of individual users at hundreds of TV and Radio content producers, including public broadcasters (ABS-CBN, BBC, CBC, DR, FMM, France TV, RAI, RFI, Russia Today, RT Malaysia, VOA), commercial networks and operators (Canal+, FOX, eTV, MBC Dubai, MediaCorp, Mediaset, Orange, Time Warner Cable, Warner Bros, Sirius XM Radio), and government organizations (Canadian House of Commons, Australian Parliament and UK Parliament). Dalet is traded on the NYSE-EURONEXT stock exchange (Eurolist C): ISIN: FR0011026749, Bloomberg DLT:FP, Reuters: DALE.PA. Dalet® is a registered trademark of Dalet Digital Media Systems. All other products and trademarks mentioned herein belong to their respective owners. In the past hour, I have “instant messaged” five people who live in three different countries. I learned that my friend in India just had a child, my college friends want to have a reunion next month in Bali, and I am late for dinner. WhatsApp, Gchat, Facebook Messenger, etc., have given us instant communication regardless of location. Language has also developed for chat similar to the way shorthand was used by journalists of yesteryears. Messaging someone ‘LOL,’ ‘ROFL’ or using emojis can convey a person’s emotional state, and the ability to send audio, images and videos attached to text has increased our use of multimedia in communication. Dalet capitalized on the growing popularity of chat as a means of communicating by integrating it with Dalet Galaxy. Journalists and others working for the newsroom using phones, a web client and desktop computers have at their fingertips the ability to collect as much information, including various multimedia, about an event as possible, enabling them to form a viewpoint that is both informative and balanced. With the ability to create chatrooms in Galaxy, journalists can collaborate with people in the newsroom about an ongoing story as well as with various bureaus and reporters on the road. What’s more, with XMPP technology, chat is no longer limited to one messaging app, as Dalet chat users can send and receive chats with multiple chat services including Facebook Messenger, Gchat, WhatsApp and many more. Whenever a story, planning event and new recording is created, everyone who subscribes to notifications from Dalet Chat will receive a message, even if they are offline, and with a click, a user can open the item, be it a textual story, video, image or audio recording. Let’s go through the lifecycle of a story at a local TV news channel and see how chat is used in the newsroom: [12:22 PM] Bob the Reporter receives a text from a source in town hall that Tim the Politician is stepping down. [12:45 PM] Bob forwards this chat to the Assignment Desk Chat Group to find out more information. [12:47 PM] Wendy on the Assignment Desk creates a Planning Event about Tim the Politician stepping down. [12:52 PM] As Phil, the Town Hall Correspondent, receives the chat, he looks up and sees Mary, Tim the Politician’s secretary, walking towards the cafeteria. [12:55 PM] On the record, Mary confirms that Tim the Politician is stepping down because of personal reasons – a sound bite that is recorded as an audio clip on Phil’s phone, which is then automatically uploaded to the Newsroom. [12:57 PM] Wendy on the Assignment Desk associates this audio clip with the Planning Event, and messages Phil to get a picture of Mary if he cannot take video. [13:01 PM] Tom the Producer receives a chat notification that the story about Tim the Politician stepping down has been confirmed by a source, and Tom creates a 30-second story in the 2 PM News. [13:02 PM] The 6 PM News chat group and other producers receives a chat notification of the upcoming story, and Kevin the Reporter sends a chat to Tom the Producer that he wants to cover the story as he golfs with Tim the politician’s friend Greg. [13:04 PM] Tom the Producer assigns the story to Kevin and the 6 PM News Chat Group is notified of this assignment. [13:06 PM] Kevin clicks the chat notification on his phone about the assignment of the story and sees that Wendy on the Assignment Desk has set up a Twitter Harvester to collect Tweets using the hashtags #TimThePolitican and #TimStepsDown, associating tweets to the story along with Phil’s audio recording of Mary confirming Tim the Politician is stepping down. [13:08 PM] Kevin sends a chat to Greg, Tim the Politician’s friend, who is on Facebook Messenger, requesting an interview. [13:10 PM] Greg denies that Tim the Politian is stepping down, so Kevin sends him the audio recording of Mary confirming it. [13:12 PM] Greg, caught in a lie, sends Kevin a guilty emoji and confirms an interview in the next 30 minutes. [13:16 PM] Kevin sends a message to Wendy on the Assignment Desk that an interview has been confirmed with Greg in 30 minutes at 123 Major Street. [13:18 PM] Wendy updates the Planning event that a camera crew is needed in 30 minutes at 123 Major Street. [13:22 PM] Neil the Cameraman receives the message about the interview while he is grabbing lunch and sends a message to Wendy that he is five blocks away from 123 Major Street and that he will take the job. [13:24 PM] Tom the Producer receives the chat that the interview has been confirmed and moves the story of Tim the Politician to the top of the rundown. [13:28 PM] David the Content Producer receives the notification that a big story about Tim the Politician is breaking at 6 PM and creates a headline for Christy the Anchor to read. [13:33 PM] On her way to the studio, Christy the Anchor receives the text about the headline she has to read and on her phone changes the text slightly. [13:30 PM] Neil the Cameraman and Tom the Reporter go to 123 Major Street to conduct the interview. [13:33 PM] Wendy on the Assignment Desk, receives a text from Calvin the Reporter on the Police Beat, that Tim the Politician was arrested the night before for a hit and run. [13:34 PM] Tim the Politician’s friend isn’t giving much information during the interview, so after receiving the text from Wendy on the Assignment Desk about the hit and run, Kevin the Reporter changes his line of questioning to Greg, Tim the Politician’s friend, to get information about the incident. [13:37 PM] Chris the 1:30 PM News Producer, receives a chat notification that the interview of Greg, Tim the Politian’s friend, is turning into a good story, so Chris messages Patricia the Director of the 1:30 PM News, to make the story of Tim the Politician stepping down because of a hit and run breaking news for the 1:30 PM Show. [13:40 PM] The story of Tim the Politician stepping down because of a hit and run breaks at 13:40 PM. As you can see, Dalet Chat enables anyone working for the newsroom regardless of location to always be in synch, increasing the speed of breaking news while elevating the amount of information from sources, giving a more rounded viewpoint to the audience listening on the radio, watching TV or viewing content on the web.